Researchers at North Carolina State University have found that a tiny aquatic plant can be used to clean up animal waste at industrial hog farms and potentially be part of the answer for the global energy crisis. 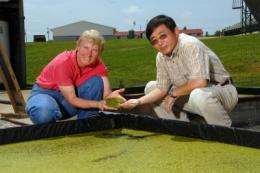 Their research shows that growing duckweed on hog wastewater can produce five to six times more starch per acre than corn, according to researcher Dr. Jay Cheng. This means that ethanol production using duckweed could be "faster and cheaper than from corn," says fellow researcher Dr. Anne-Marie Stomp. "We can kill two birds - biofuel production and wastewater treatment - with one stone - duckweed," Cheng says. Starch from duckweed can be readily converted into ethanol using the same facilities currently used for corn, Cheng adds. Corn is currently the primary crop used for ethanol production in the United States. However, its use has come under fire in recent years because of concerns about the amount of energy used to grow corn and commodity price disruptions resulting from competition for corn between ethanol manufacturers and the food and feed industries. Duckweed presents an attractive, non-food alternative that has the potential to produce significantly more ethanol feedstock per acre than corn; exploit existing corn-based ethanol production processes for faster scale-up; and turn pollutants into a fuel production system. The duckweed system consists of shallow ponds that can be built on land unsuitable for conventional crops, and is so efficient it generates water clean enough for re-use. The technology can utilize any nutrient-rich wastewater, from livestock production to municipal wastewater. Large-scale hog farms manage their animal waste by storing it in large "lagoons" for biological treatment. Duckweed utilizes the nutrients in the wastewater for growth, thus capturing these nutrients and preventing their release into the environment. In other words, Cheng says, "Duckweed could be an environmentally friendly, economically viable feedstock for ethanol." "There's a bias in agriculture that all the crops that could be discovered have been discovered," Stomp says, "but duckweed could be the first of the new, 21st century crops. In the spirit of George Washington Carver, who turned peanuts into a major crop, Jay and I are on a mission to turn duckweed into a new industrial crop, providing an innovative approach to alternative fuel production." Cheng, a professor of biological and agricultural engineering, co-authored the research with Stomp, associate professor of forestry, and post-doctoral research associate, Mike Yablonski. The research, which is funded by the North Carolina Biofuels Center, was presented March 21 at the annual conference of the Institute of Biological Engineering in Santa Carla, Calif.
Cheng and Stomp are currently establishing a pilot-scale project to further investigate the best way to establish a large-scale system for growing duckweed on animal wastewater, and then harvesting and drying the duckweed. Interestingly delicious. 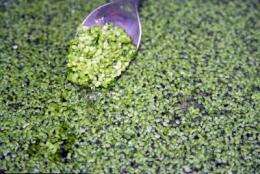 But can farmers 'grow' their own crop of Duckweed and sell it? Or would this be a combined facility that takes shipped animal wastewater? If this plant uses up the nutrients more quickly does that mean the waste ponds would cause less of an odor problem? Gol Dang it! Who threw duckweed in my hog water? Duckweed is all over, just stop by a local pond in the summer. Grows very fast, and is easy to care for (you do nothing). As for the odor problem, the plant lives off the organic waste, so as a result the odor would be less. Additionally, the duck weed serves as a cover for the pond, reducing evaporation (and hence the odor). This system is incomplete. First run your hog wastes through biodigesters so as not to waste the energy. This produces biogas, mainly methane, and a solution with all the original fertility of the hog wastes. Now grow the duckweed. Ferment the duckweed to get ethanol then feed the wastes from the fermentation to animals, probably hogs. Now pass the hog wastes back to the biodigester. Elegant, no? Note: Duckweed is a tiny, floating, flowering plant, not an algae. Since the wastes from any ethanol fermentation process contains great amounts of yeast cells, it's a great animal feed. "Awwww, Mom, recycled wastewater and duckweed starch for dinner again!?!"